Next month I’ll be flying down to Ibex (Tule Valley UT) for some airplane camping. I’m renting a 172 with a $2,500 damage deductible and I really want to make sure that the airplane is secured with good tie downs. There is already a huge pilot shortage and jobs are out there for those who decide they want to fly for a living. I do not fly for a living but here’s my experience on becoming a private pilot a second time, 20 years later. Brief Challenger SRT8 review, is it still competitive? I rode to work this morning at 80MPH with a temperature of 28 degrees F, that’s a windchill factor of 4.7 degrees F(-15.2C). Refreshing. Buying a Motor Swap Vehicular, ITS GOTTA HEMI! I mentioned a possible trade for my Paramotor for a Dakota with a HEMI. Long story short, I’m thinking about taking this pickup in on a trade for my paramotor. I’m asking $6,500 and he’s asking $6,500, seems like a good trade. Especially, since selling a paramotor as the snow begins to fly is not easy. How do I catch the S.O.B. who sits and smokes on my car? Guilia is really on her own platform? Definetly not sharing, thank goodness. So last month I posted asking about the effort to take ownership on an abandoned vehicle. A tired ‘99 Passat had been left in our work parking lot for a few weeks. As it turns out, it was a very simple process to take ownership. Abandoned VW - How do I make it mine? Feisty 1.0L Ecoboost, 200 HP from the U.K.? Is this true and what was required to do so? If you can get 200 HP reliably out of 1 liter that would be awesome in a 2500Ib hatch. I’m guessing another turbo required since the stock turbo compressor wheel is about the size of a small CPU fan. Tule Lake Bed UT so awesome. I’m getting the powered paragliding thing down. I've got two International Travelalls. Both are 4-speed 345 V8s, 2wd. The blue one has a better body, the gold one has better glass and a good interior. Combine both for a sweet tall wagon, one is a 1968, the other a 1969? They are scheduled to be scrapped if no one wants em. They are in Woods X UT. New Camaro and other Coupe? Anyone post this yet? The sound is just fantastic. It has wheels, it burns gasoline, and I'm looking forward to figuring it out. My Ram - Just posting some pics for the web hosting. Looking to install more noise via Mopar Cold Air Intake and 14" Magnaflow V muffler. 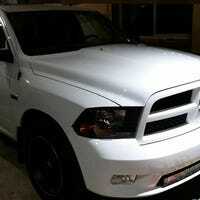 I love my Ram. Winds were blowing 70 MPH last night. I took the kids out for a drive to enjoy it. Seems like it picked up this morning.